Display notes, artwork and work assignments on natural cork surfaced boards. 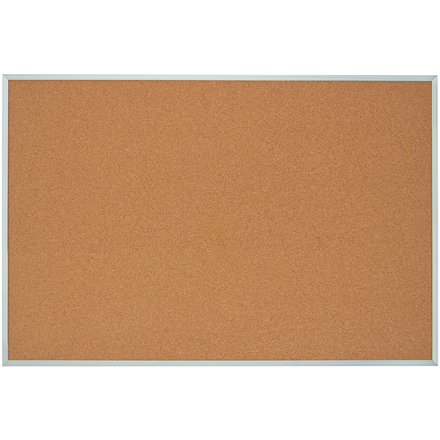 Thick, self-sealing natural cork surface which is laminated to sturdy fiberboard. Factory installed hangers for mounding. Push pins and tacks hold materials firmly. Aluminum and oak framed boards can be hung landscape or portrait. Aluminum frames are made from satin anodized aluminum. Oak Frames are made from solid hardwood with a light oak finish. Combo - White, non-magnetic melamine surface one side, natural cork on the other. Oak frame. Enclosed boards feature a satin anodized aluminum frame with durable, shatterproof, clear acrylic windows. Doors are lockable and 2 keys are included.